Harry Connick, Jr. on stage at Tanglewood. Hilary Scott photo. Connick at the keyboard accompanying himself. It was a wild and crazy Labor Day weekend concert with Harry Connick, Jr. and a stellar 13 piece band in the Shed at Tanglewood. Because of a severe weather warning we were informed that the concert might be delayed, interrupted or cancelled. Those on the lawn were invited in minus their picnic paraphernalia. The concert started on time “With a Song in My Heart” at the ungodly early hour of 7 PM and continued with Connick seated at the edge of the stage delivering the title track of a new CD Every Man Should Know ending at 8:50 PM. In between was the most entertaining Tanglewood show of the summer. 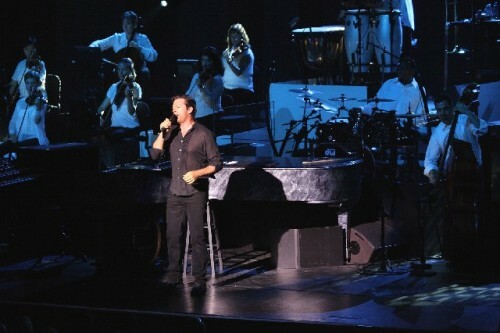 Casually clad in a loose black tuxedo shirt over black jeans Connick bounded about the stage with frenetic charm. He performed in a wide range of genres including big band jazz crooner, zydeco, Broadway, funk, Gospel, blues and even Bossa Nova. He shifted about playing a variety of instruments from superb piano and organ, to so so trumpet, and even a brief stint on congas. Most unusually he had bass drums under the grand piano for an extra kick now and then. Most generously he featured superb sidemen including New Orleans style trombone player and vocalist, Lucien Barbarin, and multi-valent guitarist and singer Jonathan DuBose, Jr. Now and then a locally assembled six piece string section kicked in. Everyone bolted up and turned around when early on there was a chorus of outbursts at the back of the Shed. The heavens unleashed their fury with a torrential downpour accompanied by thunder and lightning. Responding to the violent weather Connick invited the Lawn folks to come down to the front area and sit in the aisles. This led to a hasty meeting with the head usher. Milking the moment Connick informed us that it would violate laws of the fire marshal. With comic emphasis he stated “It’s raining!” Cats and dogs in fact. That would seem to limit the risk of fire. With a disappointingly light turnout there was ample seating for all of those seeking shelter from the storm. Considering that Connick has three Grammy awards, two Emmy Awards, two Tony nominations, and has recently been named as a judge for American Idol, it’s hard to explain the soft gate. The long running Tanglewood Jazz Festival which ran out of Ozawa Hall and in a cafe tent on Labor Day weekends was scrapped. That series struggled to make its nut. Ironically, several times because of weather challenges. With the BSO closing the prior weekend management has experimented to find a way to program the shoulder season. The festival ended on Sunday with a matinee of Pops featuring Patti Austin in a Tribute to Ella Fitzgerald. Perhaps management might rethink the Tanglewood Jazz Festival which presented emerging artists in a mix with established artists. Top tier jazz performers have been programmed into the regular season at Ozawa Hall but less so this year. A concert with trumpet player and composer of film scores, Terence Blanchard, drew a small audience. They were hanging from the rafters, however, for the young Grammy winner, the jazz bass player Esmeralda Spaulding. What a pity that more folks didn’t turn out for the wonderful Connick performance. Perhaps the modest audience had less to do with the artist and was more about the nature of Labor Day weekend when folks have other plans. It’s the last gasp of summer and Berkshire vacationers are packing to return to school and jobs. Early on in the set Connick drew upon his roots in the Crescent City. Barbarin came down from the flats to strut and jive out front with his Third Line, titubating, gut bucket, slide trombone. Sliding over to the piano Connick embellished the Duke Ellington riffs of “Caravan” written for the valve trombone player Juan Tizol. He stretched the piano from the classic, florid style of Ellington into choppy bop runs and chord clusters. Through the evening Connick often performed as a quartet with piano, bass, drums and percussion. In these sequences he stripped down to feature his jazz roots and musicianship. We learned that he trained as a classical pianist and recalled visits to Tanglewood. As a young pianist he joined the band of jazz legend Lionel Hampton. The vibes player was a star of the Benny Goodman band. Having rocked the audience into a nice groove Connick brought on guitarist Jonathan DuBose, Jr. with whom he recorded Every Man Should Know. The new CD is his 30th studio album and the 7th on which he has written and arranged all of the music . It’s always tricky when artists introduce new material. There has to be a balance between new music and familiar hits in order to promote the latest CD. Here he struck a compelling balance and I plan to cop it on Amazon ASAP. Flanked by tenor sax, Jerry Weldon, and DuBose on guitar, surprisingly Connick performed his new Bossa Nova inflected “I Love Her.” There was a Getz/ Jobim flavor to the lilting song. Pulling out another stunt from his trick bag Connick moved to synthesizer to get down with a funk call and answer with DuBose. That experiment has proven to be a hard sell with fans and on this occasion it was a brief excursion. There was a quick detour back to New Orleans with an original “Take Me to the City Beneath the Sea.” As an explanation he reminded us that the city is below sea level hence its perennial hurricane and flood issues. Introducing a new song “Time to Go” he related a complex and poignant back story. Connick’s father, a former Attorney General, is also a regular guest singer in New Orleans night clubs. In one such venue the featured singer was an elderly former star Julius LaRosa. He enjoyed a mercurial career and precipitous decline following being fired on air from the then popular Arthur Godfrey Show. My older sister attended his Boston show and was briefly a fan. By the New Orleans gig he was pretty washed up and nobody was listening in the noisy club. Connick’s dad took the mic and berated the audience for their lack of respect. The incident inspired a deeply moving song from the new CD which has potential to become a cabaret standard. Hopefully that day is a long way off for Connick. Perched on the edge of the stage he invited two ladies from the lawn refugees to join him. Looking at them he asked if they were related. They proved to be mother and daughter. Mom departed as he befriended 15-year-old, oh so shy, Sophia. From the new CD he sang to her “One Fine Thing” but became self conscious about the lyrics. He has three teenage daughters and would be embarrassed if they caught wind of this encounter. All the swooning women around us would have loved to change places with Sophia. He seems to have an ardent fan base of thirty-somethings. Then it was more Crescent City fun with flashes of Dr. John and Professor Longhair riffs of zydeco swing. 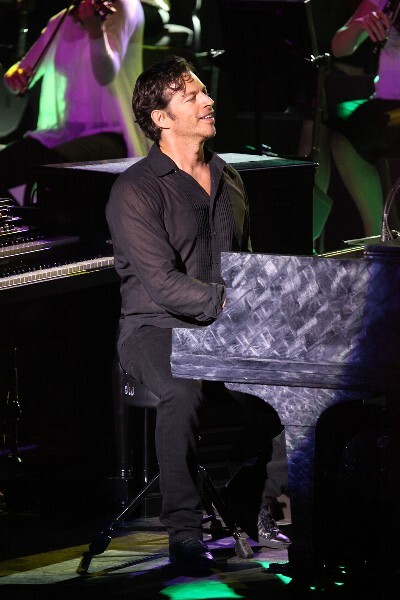 Here Connick was thumping away at those bass drums under his piano. Then be bolted up demonstrating how they dance during Mardi Gras. Turning his back to the audience he shook his bootie. That evoked howls of feminine excitement. Asking if there was time for one more he closed with “The Way You Look Tonight.” Then returned soon after replacing a soaked shirt and toweling off. There was just a mild drizzle as we made our way to the car and drove home from our last night at Tanglewood. Until next year he left us with sweet dreams for our pillows. "Harry Connick --as you aptly point out-- is the consummate entertainer. It remains the puzzle of the year that his concert was not sold out (and, as you also point out, this was fortunate for those holding lawn tix). What has escaped notice is that the emergency weather warning system broadcast an "All clear, OK to return to the lawn" just before the biggest lightning bolts and loudest (nearest) thunderclaps exploded. Ooops. I'm with you: bring back the jazz festival; perhaps the late-season offerings were a nod in that direction."